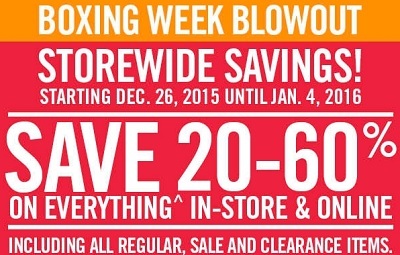 Enjoy Boxing week blowout from Mark’s Canada. You can save up to 60% off original retail prices! Almost everything included. Deals from Mark’s will be available online and in-store. Offer is valid through January 4th, 2016. Source: Mark’s Canada. More details about the promotion available online or at your nearest Canadian store.